Two weeks ago, Jack and I had our first (and hopefully last!!) ambulance ride. I will start by saying everyone is perfectly fine, but it was a scary morning. I was dropping him off at day care and his teacher took him from me while I was filling out his form. She was walking and tripped over a beach ball and both she and Jack fell to the floor. I had my back to them, so didn't see exactly how he landed, but when I turned back around he was face down on the floor (awake). He was really upset for 15 minutes or so and then mostly calmed down, but he seemed very pale and a little drowsy. He wouldn't let me go, so I hung around for awhile and next thing I know he's vomiting. That's when I lost it of course, but day care was already all over it - an ambulance was on its way. We noticed a bruise on the top of Jack's left ear, so we assume he hit the side of his head, but his teacher who was the only one who saw how he landed was getting her knee looked at, so we weren't sure. Jack and I rode in the ambulance with lights and sirens on while the paramedic looked in his eyes and tried to take his blood pressure (he wasn't having it). He said his pupils looked good and the fact that he recognized the paramedics were strangers and didn't want anything to do with them was a good sign. BUT Jack was dozing off during our 5 minute ambulance ride, which was pretty scary. The paramedic kept waking him back up to make sure he could rouse him. After we got to the ER they looked him over more thoroughly and he vomited again. Then Daddy got there and they gave Jack some anti-nausea medicine and Motrin. 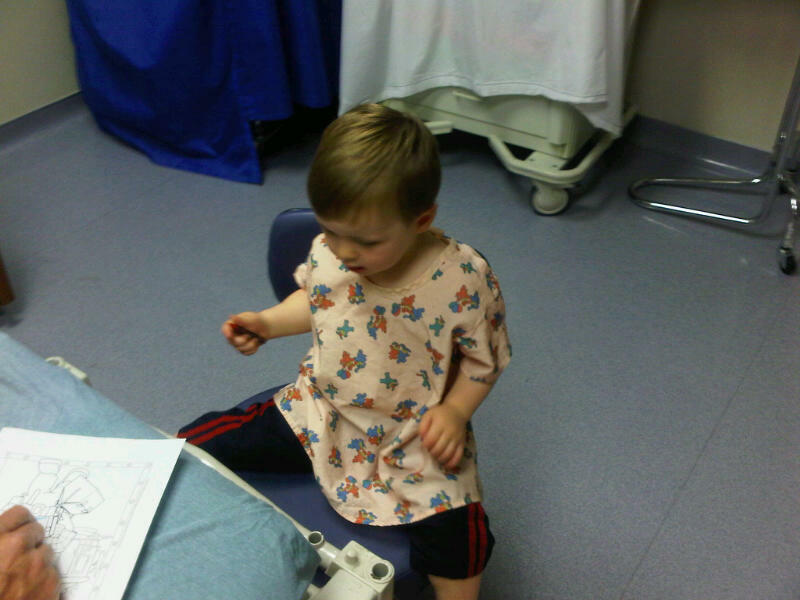 Within about 30 minutes he started to perk up and was back to his normal self in no time, exploring the whole ER. Turns out the St. John's has a nice pediatric ER (would have preferred to go my whole life without finding that out). They wanted us to try to get him to calm down and ideally fall asleep so they could take a CT scan of him, but he wasn't interested in sitting still. They weren't worried enough to sedate him to get the scan, so they fed him some graham crackers and apple juice and sent us on our way. When we got home I gave him a bath to wash the vomit off and noticed a bruise on his left shoulder too. That made me feel better - hopefully he landed more on his shoulder than his head. I slept on his floor while he napped (they told me not to worry about waking him every so often, as long as he was breathing) and slept on his floor that night until my pregnant body couldn't take it any longer. He is perfectly fine but could have been a lot worse - we are very lucky. The nurse at the ER said it was a concussion, but his release papers simply say he was treated for "a fall and vomiting," so we're not sure it was an official diagnosis.